GENEVA (Reuters) - The United Nations Human Rights Council on Friday condemned Israel's "apparent intentional use of unlawful lethal and other excessive force" against civilian protesters in Gaza, and called for perpetrators of violations in the enclave to face justice. 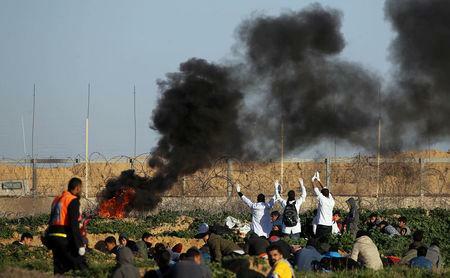 Protests at the border between Israel and the Gaza Strip began in March last year, with Palestinians demanding Israel ease a blockade of Gaza and recognize their right to return to lands their families fled or were forced from when Israel was founded in 1948. On the final day of a four-week session, the Geneva forum adopted a resolution on accountability, brought by Pakistan on behalf of the Organization for Islamic Cooperation (OIC). The vote was 23 states in favor, eight against, with 15 abstentions and one delegation absent. It called for cooperating with a preliminary examination opened by the International Criminal Court (ICC) in 2015 into alleged Israeli human rights violations. The resolution was based on a report by a U.N. inquiry which said that Israeli security forces may have committed war crimes and crimes against humanity in killing 189 Palestinians and wounding more than 6,100 at weekly protests last year. "The targeting of civilians is a serious matter that should not be condoned," Palestine's ambassador Ibrahim Khraisi said, citing the report's findings. The toll included 35 Palestinian children, two journalists, and medical workers, he noted. "There have not been any injuries inflicted on any Israelis, be they military or civilians," he said. Israeli ambassador Aviva Raz Shechter denounced what she called "clear evidence of political bias against Israel" in the report but said that authorities were "examining individual incidents". She accused the independent panel of ignoring "the very real threat" posed to 70,000 Israeli citizens living along the border by 1,300 rockets fired by Hamas militants during the period of inquiry, March 30-December 31. In Jerusalem, Israel's Ministry of Foreign Affairs issued a statement dismissing what it called an "absurd, hypocritical ritual" of singling out Israel for criticism in "predetermined" findings that ignored the reality on the ground. European countries were divided on the resolution, with Britain and Italy abstaining, while Spain voted in favor and Austria and Hungary against. The United States did not participate, having quit the body last year over perceived anti-Israel bias. "Hamas of course bear principle responsibility as their operatives have cynically exploited the protests and we are clear that Israel has the right to self-defense," Britain's ambassador Julian Braithwaite said. "But equally we have publicly and privately expressed our long-standing concerns about the use of live ammunition and excessive force by the IDF. Our decision to abstain reflects this balance."